As primary eye care providers, we are concerned with how diabetes, and the vascular changes associated with diabetes, affect ocular health. The changes we see in the eye are often occurring in other parts of the body, as well. We correspond with your primary medical doctors to update them on your ocular health and our plans to manage your ocular health. In addition, we send them copies of the retinal images we take at each visit for their records. Your overall health is a priority to us. Diabetes has become a leading cause of new blindness in the United States. When a person has poor glucose control, or before a definitive diabetic diagnosis has been made, often the first symptoms a person has is a blurring of vision. Usually, these initial vision changes resolve once the glucose levels are restored to normal levels. Our Federal Way & Puyallup optometrists are experts in diagnosing Diabetic Eye Disease and will coordinate with your primary care physician on any treatment that may be needed. As with most diseases, early detection and treatment is essential to prevention and successful outcome. Diabetes is a vascular disorder, and the smallest blood vessels, the capillaries, are the most vulnerable. The eye has an abundance of these capillaries, and the eye is also the only place in the body that we can see working blood vessels. Diabetic Eye Disease is comprised of a group of eye conditions that affect people with diabetes. Diabetic Retinopathy is the most common cause of vision loss among people with diabetes and is the leading cause of vision impairment and blindness in working-age adults. 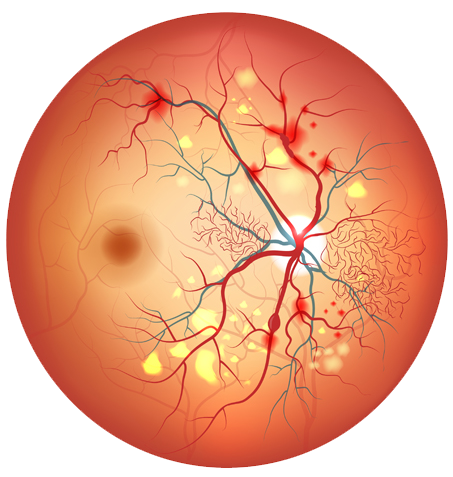 Diabetic macular edema (DME) is a consequence of diabetic retinopathy. Early detection, timely treatment and appropriate follow up care of diabetic eye disease can protect against vision loss. Diabetic retinopathy can be treated with several therapies, alone or in combination. Because diabetic retinopathy often goes unnoticed until vision loss occurs, people with diabetes should get a comprehensive dilated eye exam at least once a year. With early detection, and blood glucose control, diabetic eye disease can be prevented and/or treated.